Fiology thanks former dietician and nutrition educator Earlier FI for shaping this lesson. Our food bill can dramatically impact our savings rate. In this course, we’ll experience a potluck of ideas and resources for a fresh look at how we shop for and prepare our meals. 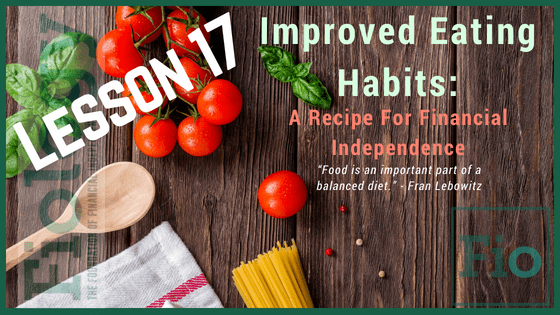 It gives us plenty to chew on with recipes to reduce our meal costs and time in the kitchen from a boil to a simmer. We can have our cake and eat it too by eating healthier and keeping a heaping tablespoon of money that can condense our Financial Independence timeline! Currently, the average American eats commercially made meals more than 4 times a week. Whether we consider eating out social events, necessities due to time constraints, or both, this choice is costly and can make our FI journey more challenging. Food is one of the Big Three household expenses so it will prove worthwhile to take a constructive look into how we can minimize it. Many small improvements in our meal planning can make a significant difference. Consider this example: oatmeal takes under 10 minutes to cook and costs about $0.15 per serving. Buying it ready-made in your go-to breakfast shop will cost close to $4. An egg sandwich takes about 3 minutes to cook and costs about $1. With just a little planning, we can experience breakfast without the inflated expense. The price differences for lunch and dinner can be more radical. Watch: 5 Days Of Meal Prep | Try Living With Lucie | Refinery29 by Lucie Fink of Try Living With Lucie on YouTube. There are many meal prep videos on YouTube. From meal prepping for a bodybuilder to a family of six, you can find a video that matches your specific situation. Take Action: This is personal. Look closely at the food you eat. Is it the best choice for your health? Is it the best choice for your savings rate? Unless you live a considerable distance from a grocery store, eating a healthy diet does not have to be pricey. In fact, it’s less expensive than processed food. Once you decide what you want your meals to look like, break them down into ingredients or food lists. Building a grocery list around planned meals reduces wastefulness of food and of budget. Family size and personal preferences will factor into this process greatly. Be sure to compare local stores in your area to determine where you will save the most without compromising on quality for the items you purchase most often. Read: THINK LIKE A FOOD WASTE WARRIOR of savethefood.com. This is valuable if we sometimes find ourselves throwing away food. Be selective when eating out. When possible, choose restaurants happy to customize a meal for you. Even a 5 to 10 percent decline in weight can reduce the chance of disease. Choosing to eat healthy food is a big step for someone with an established habit of eating poorly.